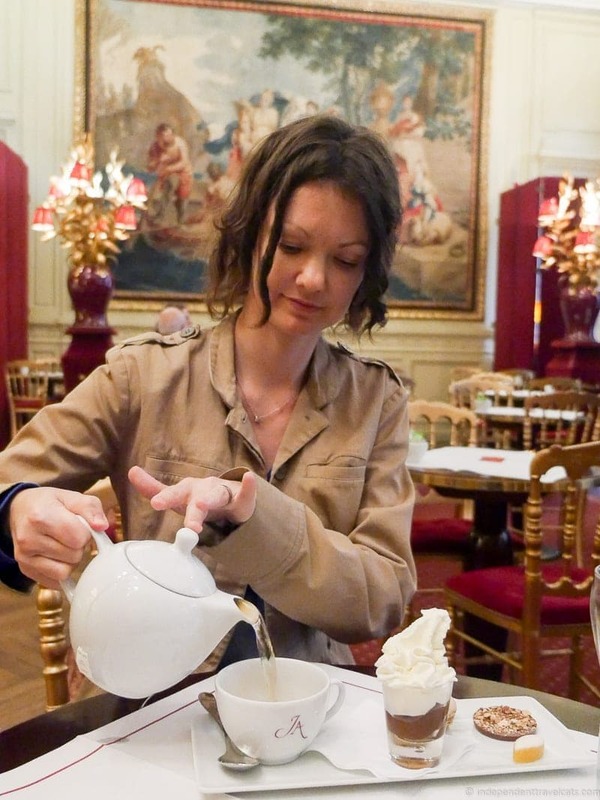 After many cups of tea, we’ve put together a guide to afternoon tea in Paris. 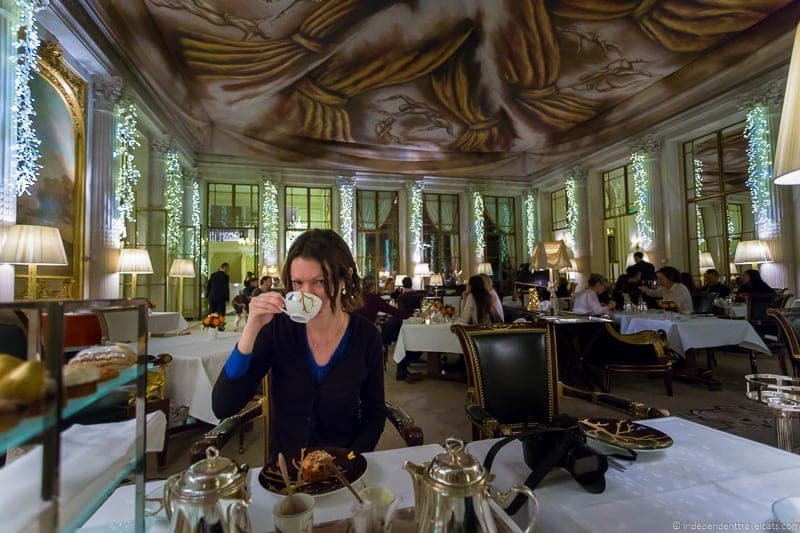 People often associate Paris with outdoor cafés and coffee and wine culture, so you may be surprised to know that there are a number of great spots for savoring tea in Paris. The act of drinking tea in France dates back to the 17th century and it was long associated with being a pastime of the aristocracy. 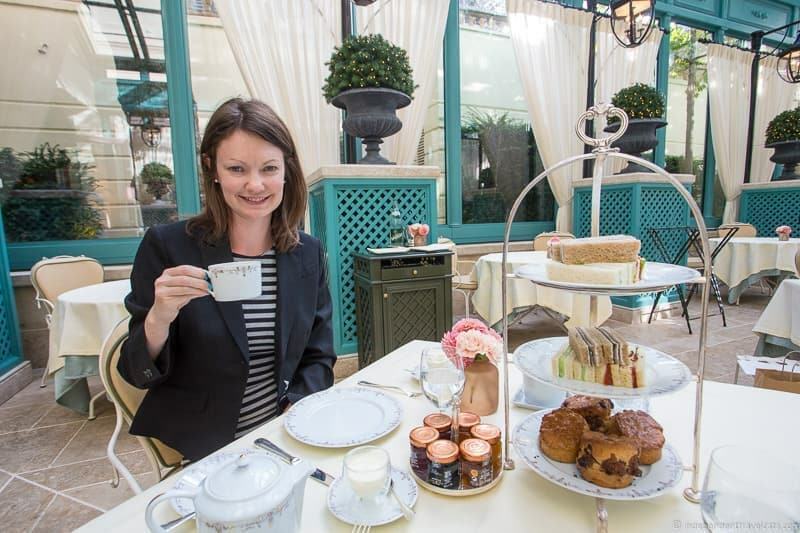 Whether you are looking for an indulgent afternoon tea served with a silver tiered tray of sandwiches and pastries at a grand luxury hotel or simply a cup of tea and a madeleine at a more casual spot, you are sure to find something that fits your taste and budget. We’ll also share some of our favorite French tea brands for those wanting to buy and savor tea at home. 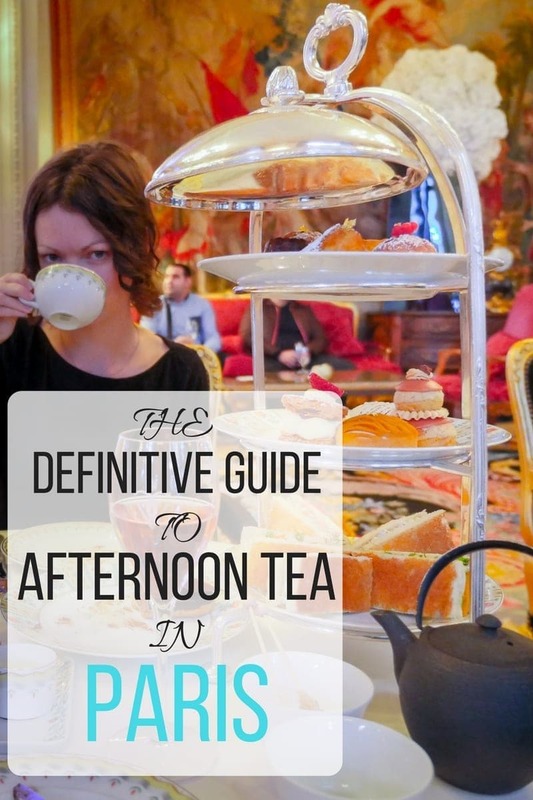 We are still exploring all the afternoon tea spots in Paris, but below is a list of some of our favorite recommended spots for afternoon tea in Paris. We’ll update this list as we discover new spots and feel free to recommend your own in the Comments section below. 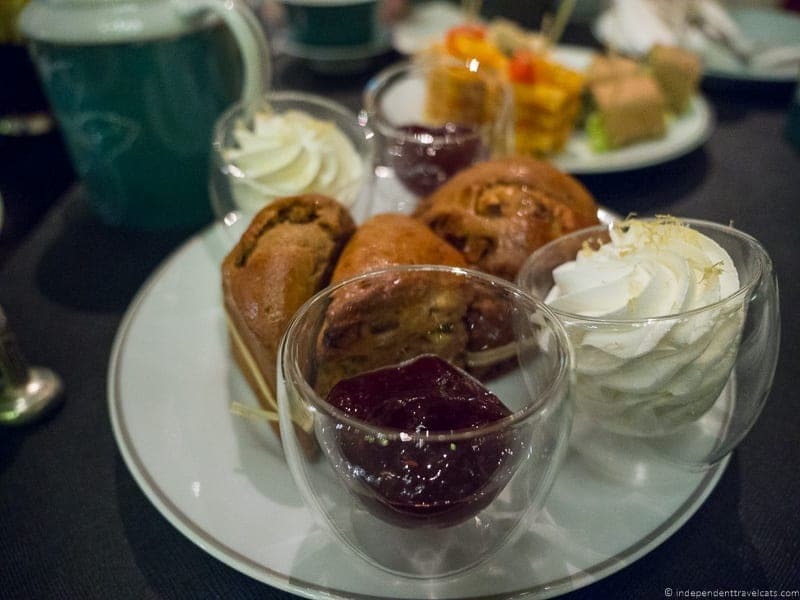 We hope you enjoy this guide and that you discover your own favorite afternoon tea in Paris. Interestingly, while tea is certainly not as popular today in France as it is in the United Kingdom, this has not always been the case. Tea was first imported and drank in France in the 17th century. At first, it was mainly drank for medicinal reasons but tea soon also became popular to drink while entertaining in the morning and afternoon among aristocratic ladies. Some sources credit the French with being the first to add milk to tea. It was also a regular drink of the court and King Louis XIV, the Sun King, who was known for drinking copious amounts of tea. It quickly became very popular among the aristocracy and was associated with royalty, leisure, and wealth. Sadly, it was this association that would mean the eventual demise of the popularity of tea in France, as the French Revolution would wipe out a number of practices associated with the royalty and wealthy, including the rituals of tea drinking. Tea drinking quickly declined in France after the Revolution as it also did in the United States after the American Revolution (e.g., Boston Tea Party). Resurgences in Anglophilic attitudes led to times when tea would gain popularity and then become unpopular again when sentiments towards the British became more negative. Nevertheless, a number of salons de thé and tea companies have flourished in France and continue to do so. In 1854, Mariage Frères would open their first wholesale shop in Paris and Dammann Frères was formed in 1925, although both of these active companies have roots in the 17th century. While tea is becoming more popular in France, it still lags well behind coffee and is very far behind the consumption rates you’ll see across the English Channel. Like the British, the French tend to primarily drink black tea varieties. Based on our experience, the French tend to prefer more delicate and refined teas, as well as more scented or flavored tea, compared to the stronger brews of the British and are also seem less likely to add milk or lemon to their tea. If you want to learn more about the history of tea in France, there are several books written on the French history of tea and the French art of taking tea. The best afternoon teas in Paris, as in many cities, are often served at restaurants within hotels. Several of the most luxurious hotels in Paris serve very indulgent and sumptuous afternoon teas fit for a queen. Most require (or recommend) reservations so be sure to book your afternoon tea time in advance. Some hotels may have dress codes, others do not, but we’d recommend that you dress smart casual or better if you are heading to one of the luxury hotels. 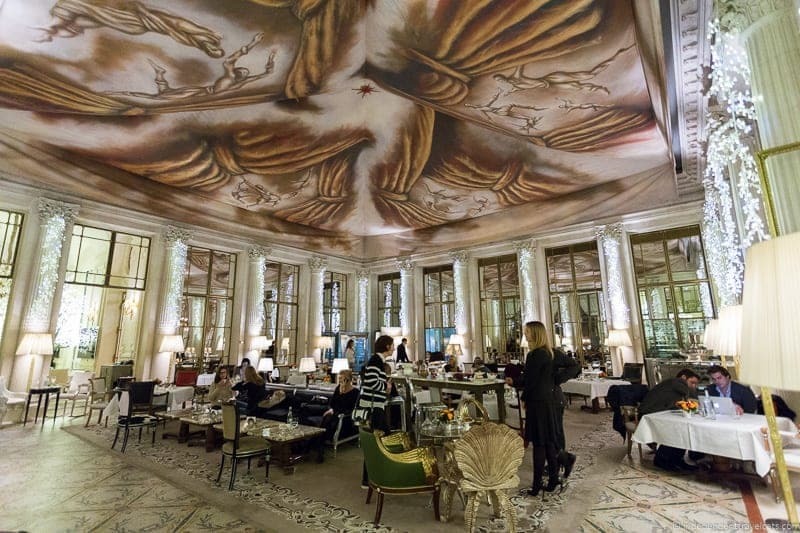 Afternoon tea is served at Restaurant Le Dalí within the 5-star Le Meurice hotel in Paris.This hotel dates from the 19th century and was a favorite for Salvador Dalí who stayed here often and inspired the name and decor for this elegant restaurant. Laurence and I enjoyed a great afternoon tea that included a silver three-tired tray full of finger sandwiches, scones with clotted cream and jam, and pastries. Another highlight was sitting under the great painted canvas that adorns the ceiling of this restaurant. This hotel dates from the 19th century and was a favorite for Salvador Dalí who stayed here often and inspired the name and decor for this elegant restaurant. Prices start at 54€ for a full afternoon tea experience. 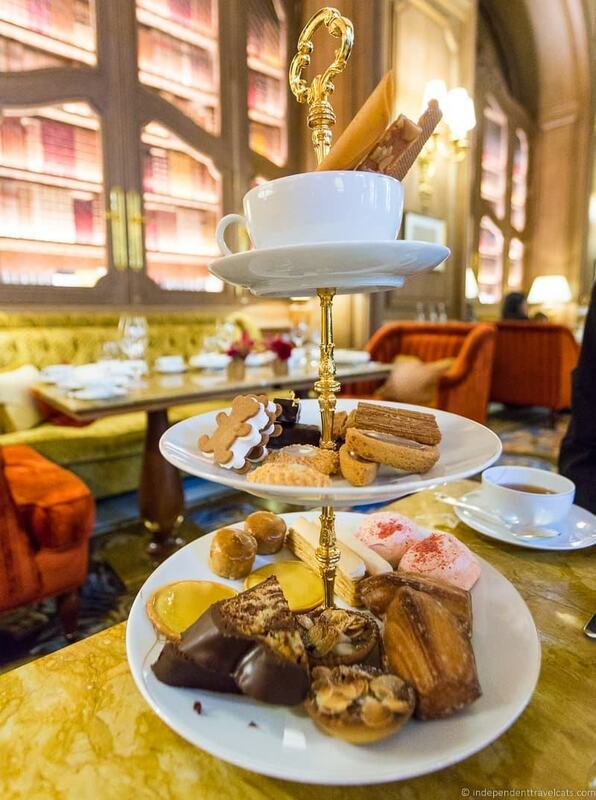 This landmark Parisian hotel offers a sumptuous afternoon tea experience in its La Galerie lounge area. 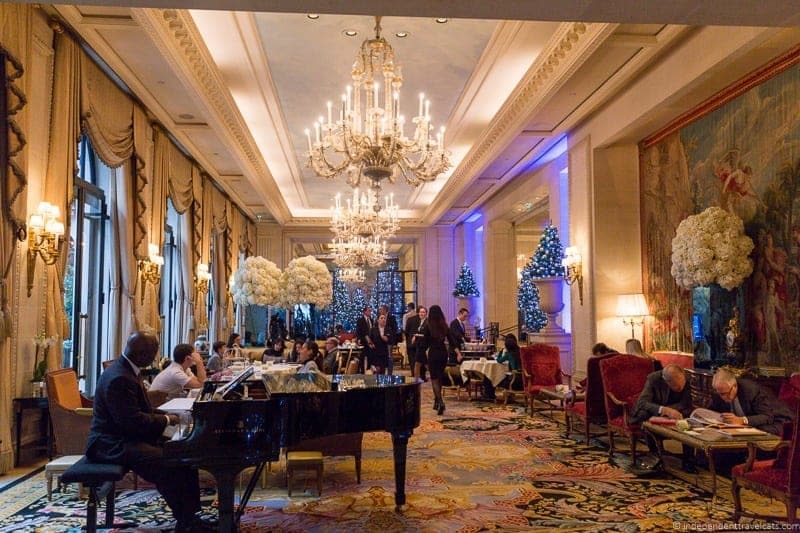 La Galerie is filled with beautiful furniture, art, and Flemish tapestries, and there is also usually a piano playing during afternoon tea that helps enhance the relaxed and refined experience. 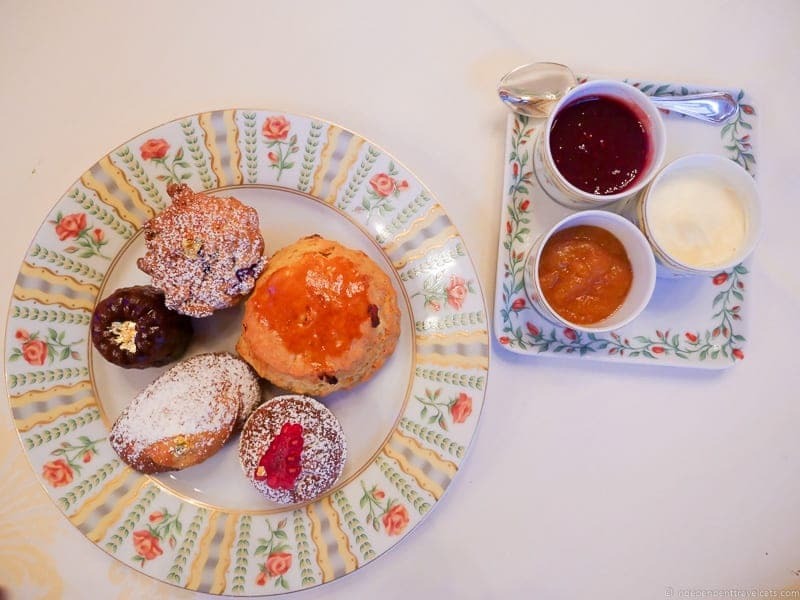 We chose from a number of fresh decadent desserts and pastries from the chef’s trolley and then we were served a three-tiered silver tray filled with finger sandwiches, scones with clotted cream and jam, and an assortment of pastries and cannelés. The Four Seasons Hotel George V afternoon tea included more food than either of us could eat, so we went home with a small box of leftover sweets that we’d savor that evening. We were also treated to a glass of champagne which is a great way to elevate any afternoon tea experience! Prices start at 50€ for a full afternoon tea experience. This impressive hotel once served as a residence for Napoleon Bonaparte’s nephew and many of its rooms and its terrace have commanding views of the Eiffel Tower! The afternoon tea we experienced in the La Bauhinia lounge area (now served in The Lounges) was one of the most interesting and unique we’ve had in Paris. Shangri-La just recently released a 100% vegan afternoon tea experience. Our vegan tea included 5 types of biscuits, 3 finger sandwiches, and 2 different scones with dairy-free clotted cream and jam. We would not have been able to guess it was vegan and everything tasted lighter with the removal of all the dairy, egg, and animal products. 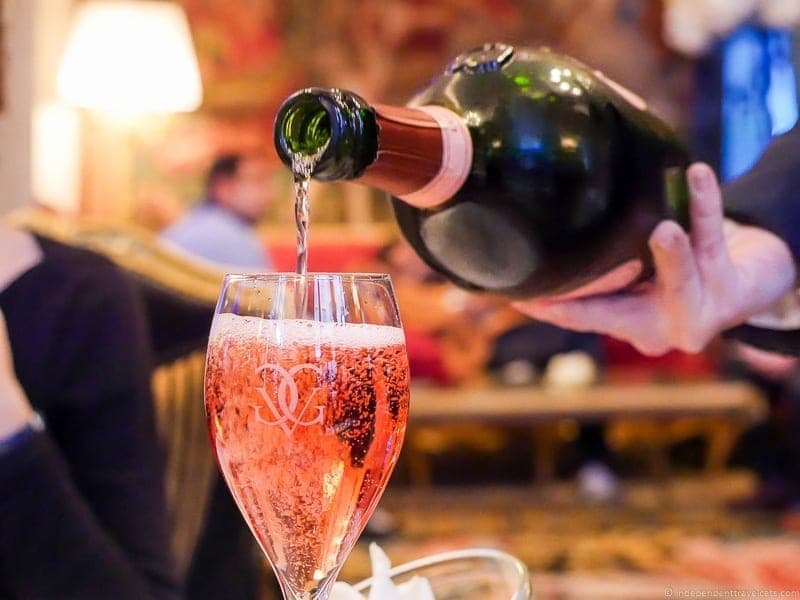 Even the Duval-Leroy champagne served with the vegan afternoon tea is vegan, which may not sound very impressive, but we learned that most champagnes are actually not vegan as animal-related fining agents are often used such as egg whites or gelatin. Shangri-La serve teas from the Dilmah tea line. 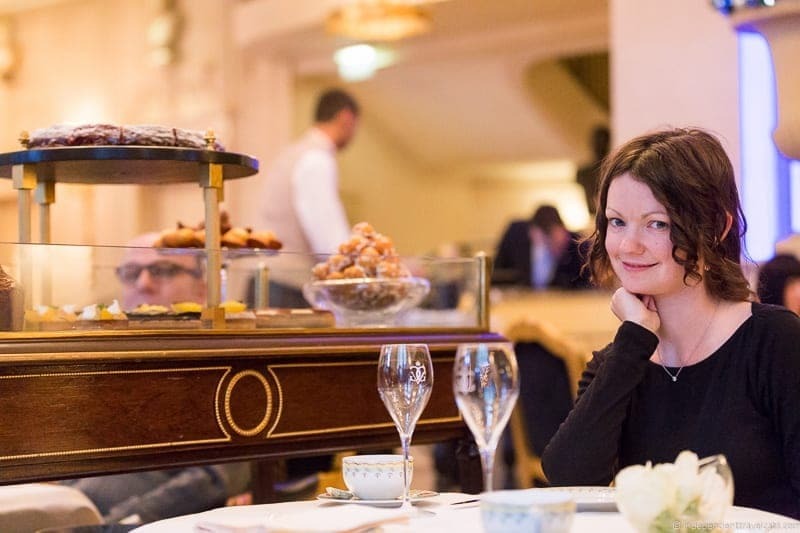 Our vegan afternoon tea experience was organized by Stephanie Boutet-Fajol, a local Parisian who operates Sacrebleu Paris, and helps discerning travelers organize their trips and arranges bespoke itineraries and personal assistance for those traveling to the City of Lights. 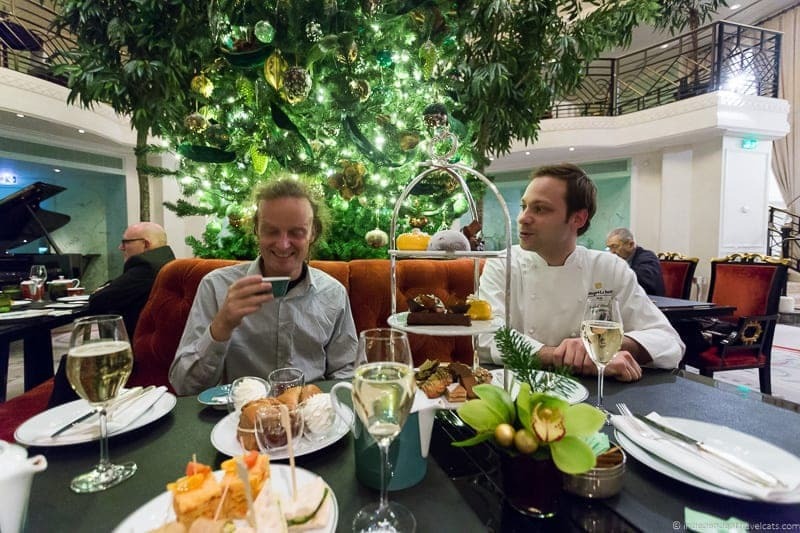 Because of friendly Stephanie, we also had the privilege of having tea with Pastry Chef Michaël Bartocetti who created the vegan afternoon tea and we enjoyed learning about the process of designing the vegan tea menu. Prices for the full vegan afternoon tea start at 45€. This legendary landmark hotel first opened its doors in 1898 and has been one of the most famous luxury hotels in Paris ever since. Hôtel Ritz Paris has been the preferred Paris hotel of a number of celebrities over the years, including Ernest Hemingway, Duke Edward VIII, and Coco Chanel. The Ritz closed in 2012 for a major 4-year renovation, and reopened again in June 2016. The Ritz currently offers two afternoon tea experiences, their specialty Le Thé à la Française served in Salon Proust and a more traditional afternoon tea served in the Bar Vendôme and its terrace. Laurence had booked an afternoon tea for my birthday, thinking he had booked the traditional afternoon tea (not knowing there were two) and so we accidentally got to sample both after learning we had booked the wrong one. Le Thé à la Française is a tea with primarily sweet foods based on French childhood and traditional favorites and includes petit fours, biscuits, tarts, ice cream, tarts, cakes, and madeleines. 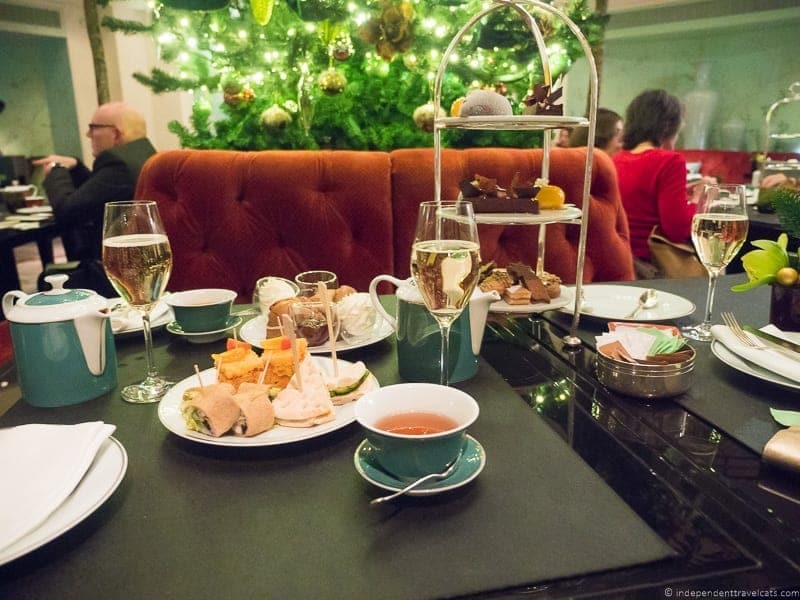 The teas include the Ritz signature blends plus a selection of reserve and rare loose teas. The traditional afternoon tea includes 3 finger sandwiches, 2 scones with jam and clotted cream, and a choice from a selection of pastries. A choice of Ritz signature and regular teas are included with this tea experience. The Tea à la Française is perfect for those with a sweet tooth and for those who want to try some of the rare teas on selection. The traditional tea is best for those who want a mix of savory and sweets. Prices for both full afternoon tea experiences start at 65€ per person. Opened as a luxury hotel in 1909, the building was originally built as a French palace to be used for government offices in 1758. It gets its name from the Duc of Crillon and his descendants who once lived here. 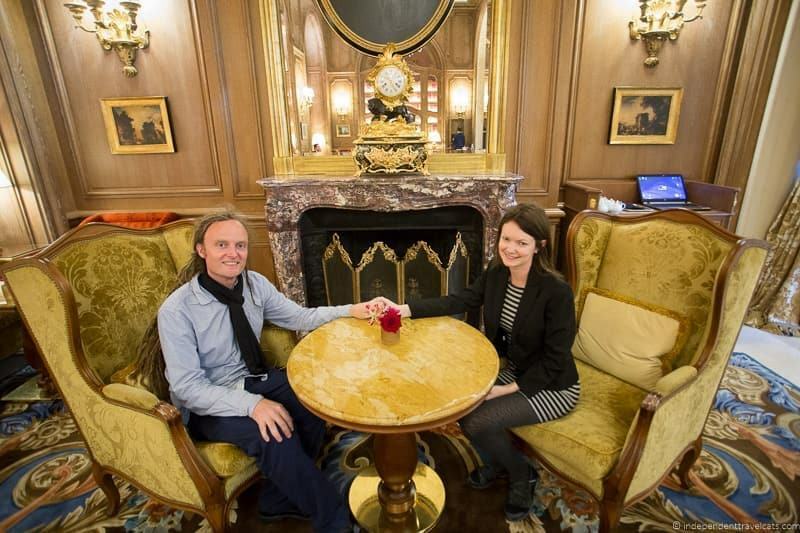 Like the Ritz, Hôtel de Crillon closed for a long major renovation from December 2013 to July 2017 after being purchased by a member of the Saudi royal family. Afternoon tea is served daily in the Jardin d’Hiver (Winter Garden) which is more of a lounge than a winter garden. 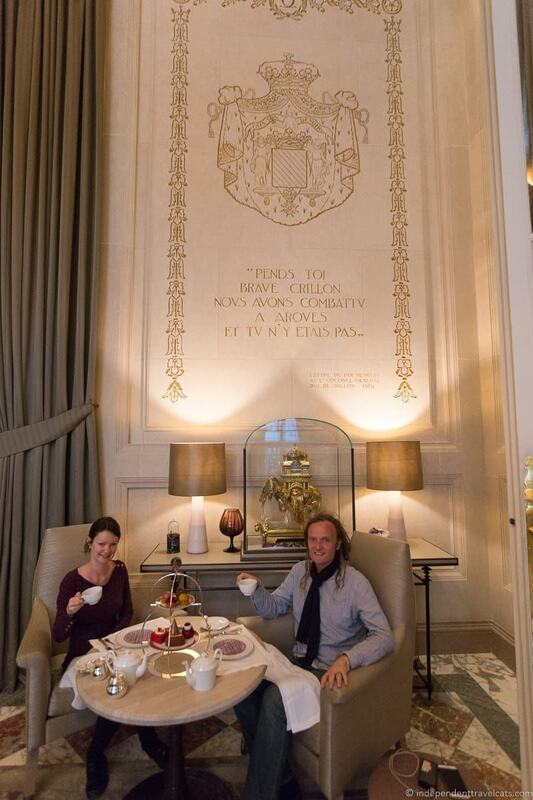 It is in this room that you can see the Crillon family coat of arms on the wall, a quote from King Henri IV to his friend the Duc de Crillon, and the hotel’s iconic Elephant Baccarat. 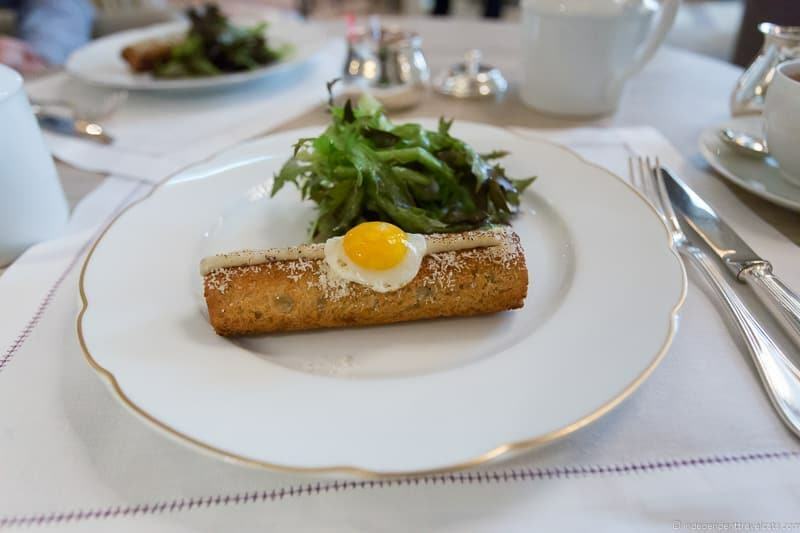 The main tea menu, and the one we tried, is called Moments of Reflection and included a choice of a Croque Madame or Croque Monsieur with salad and then a selection of pastries and tea cakes. There was a selection of about 12 tea cakes which are decadent and delicious, and inspired by places around the world. The amount of tea cakes appear to be unlimited in terms of how many you can have although we could only eat 4 a piece and turned down further offerings. The tea offerings include their classic loose leaf teas although you can also select from their list of fine connoisseur teas at an additional price. The Moment of Reflections Tea experience is priced at 60€ per person. 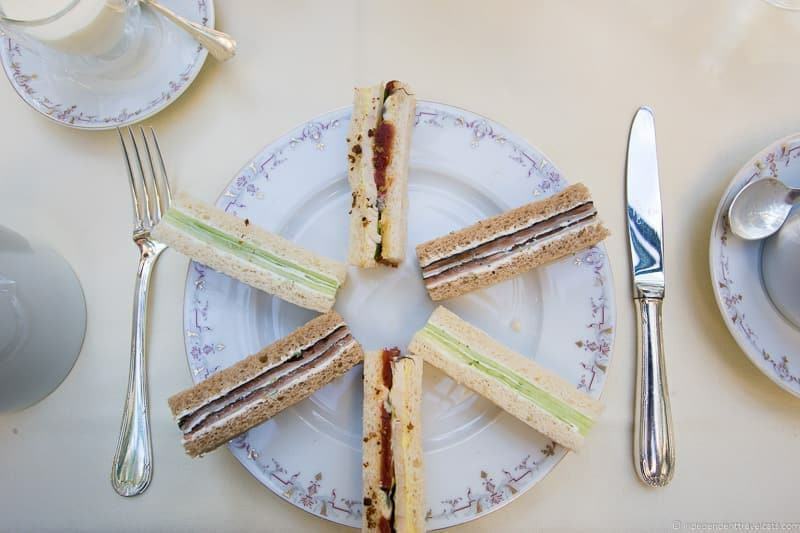 There are two other tea menus offered, one includes only an assortment of tea cakes (Four o’Clock afternoon tea) and the other includes cold treats and a cold drink (Frozen Tea Time), which both start at 38€ per person. 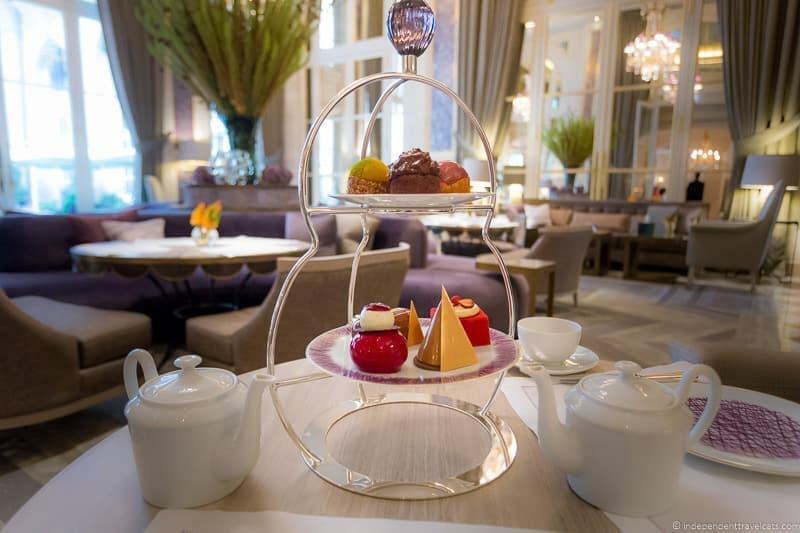 There are several other hotels in Paris serving afternoon teas that we have not yet tried, which include the Hôtel Daniel (8 Rue Frédéric Bastiat, 75008 Paris), the Mandarin Oriental, Paris (251 Rue Saint Honoré, 75001 Paris), Hotel Le Fouquet’s Paris (46 Avenue George V, 75008 Paris), and the Hyatt Vendome (5 Rue de la Paix). You might want to check at other hotels as well. These are on the list for further exploration! There are a number of restaurants, hotels, and cafes throughout Paris that offer a more relaxed and casual tea experience. These places are great if you are interested in simply enjoying a cup of tea and a sweet treat. No dress code and reservations usually not necessary. No matter what your mood you’ll likely be able to find a perfect place to have a cuppa whether it be in a historic tea salon, a famous literary coffee shop, an art museum, or even a mosque! 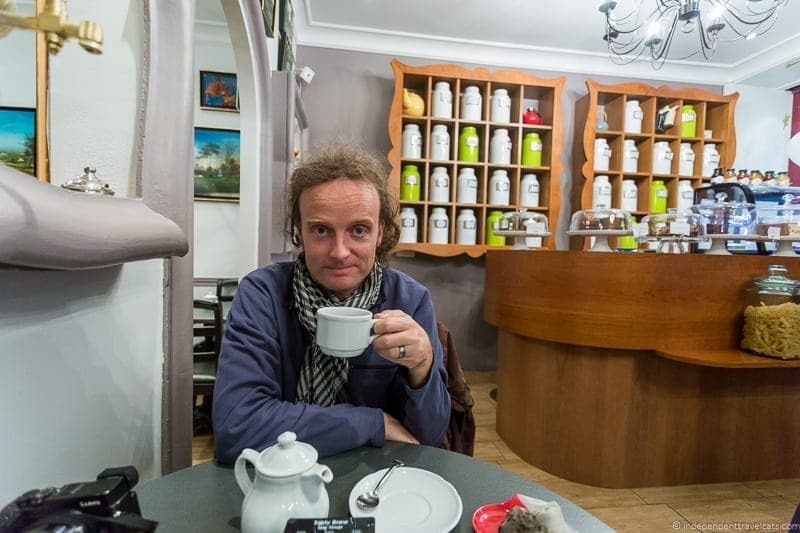 A cup (or small pot) of tea in Paris generally ranges from about 4 euros to 8 euros. Below we list 11 places we’ve been to so far! 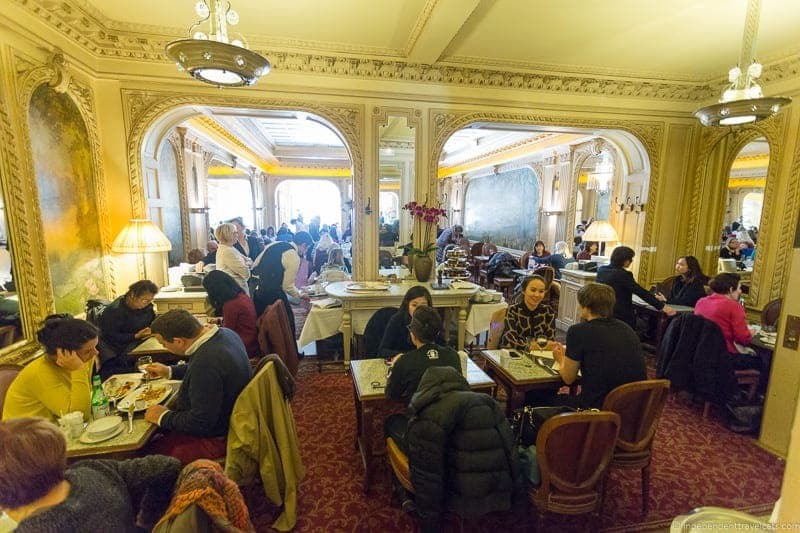 This Belle Époque café is perhaps best known for its le chocolat chaud à l’ancienne dit “l’Africain (African hot chocolate) which is absolutely indulgent and delicious made with three types of African chocolate! However, for something lighter you can enjoy a cup of tea at their Rue de Rivoli tea room; they serve their own brand of tea. Menu also include salads, breakfast and lunch options, and pastries. Note that the tea room can get quite busy, especially on weekends. This simply decorated cozy café is located on the beautiful and central Île Saint-Louis and has a wide variety of tea blends on offer. They are also known for their hot chocolate, biscuits, and pastries. La Charlotte de l’isle is a great place to escape the crowds after exploring Notre Dame and get a pick-me-up. Also don’t forget to stop and sample some ice cream at nearby Berthillon! Mariage Frères is a French gourmet tea brand and probably the best known of the French tea houses. The company has shops that sell their tea as well as some locations that have tea salons and restaurants that serve tea as well as food and desserts. 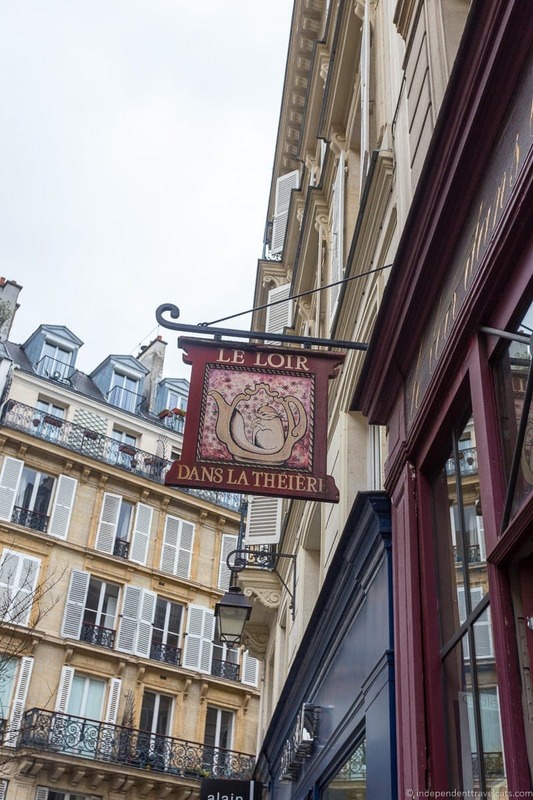 For instance, the Rue du Bourg Tibourg location includes a tea salon, shop, and a small museum. You can read about my full experience having tea at Mariage Frères when I first visited back in 2013. A great place to sample the company’s teas and then select your favorites to purchase! This private house-museum is an opulent 19th-century mansion that houses the permanent art and furniture collection of the Jacquemart-André family. This museum is seldom visited by most visitors to Paris, but it is really a gem and I’d highly recommend it for all art lovers. Even if you are not up for another museum, you might want to still take the time to visit the tea salon (free to enter) which is housed in the mansion’s former dining room. The walls of the café are decorated with flamboyant 18th-century Flemish tapestries and a Tiepolo fresco adorns the ceiling. In addition to tea (of course! ), you’ll find salads, quiche, brunch on weekends, and fresh pastries. We actually did a special tea time menu offer that included tea and 5 mini sweets. Betjeman & Barton teas were served. Ladurée is one of the most popular eateries in Paris, known for its delicate macarons, Saint-Honoré pastries, and other sweet treats. Ladurée has shops, tea salons, restaurants, and even a “le bar” location that is focused on quicker service. Locations serve salads, sandwiches, omelettes, main courses, pastries, and of course macarons. They serve their own line of teas, and also sell it in their shops. Note that Ladurée, especially the Champs Elysées location, is often very busy. To best avoid crowds, avoid the Champs Elysées location all together and for quicker service try the Rue Lincoln Le Bar location. Also going early or late is a good way to avoid lines, even at the Champs Elysées location. The Rue Jacob and Printemps locations tend to be a bit quieter but all locations can get busy. 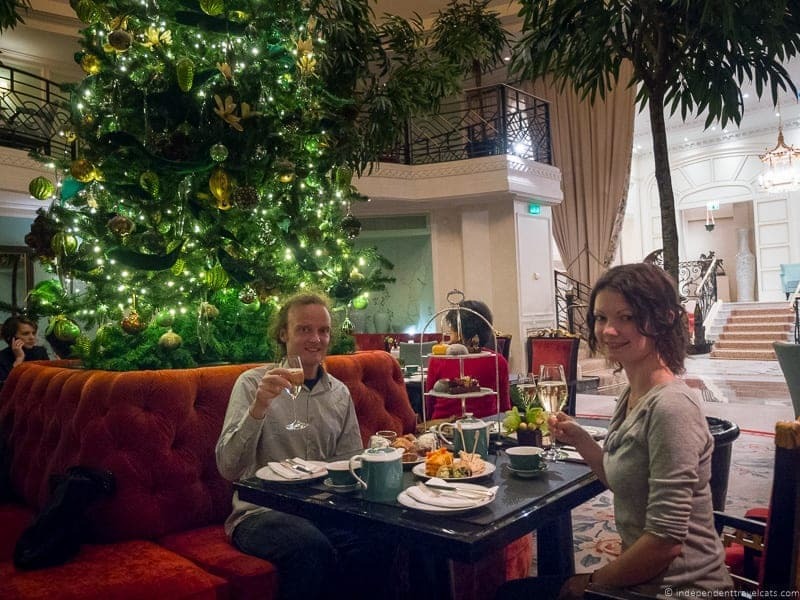 A great place to enjoy tea with some famous macarons or with a decadent dessert! 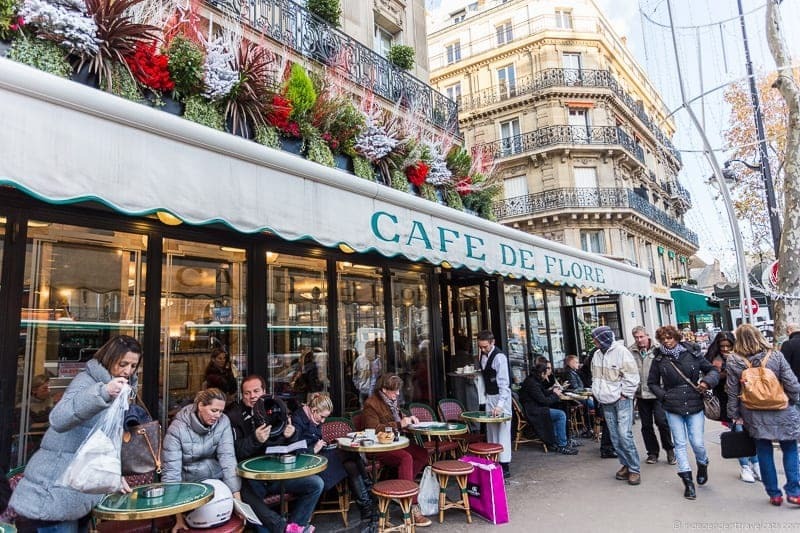 Café de Flore is one of the oldest Parisian cafés, opened in 1885, and in the 20th century it became a popular hub of famous writers, artists, and philosophers such as Jean-Paul Sartre, Simone de Beauvoir, Georges Bataille, and Pablo Picasso. Today one can sit on its sidewalk terrace or inside and either order a full meal or just have a cup of tea or coffee. The Café de Flore serves a selection of Mariage Frères tea. 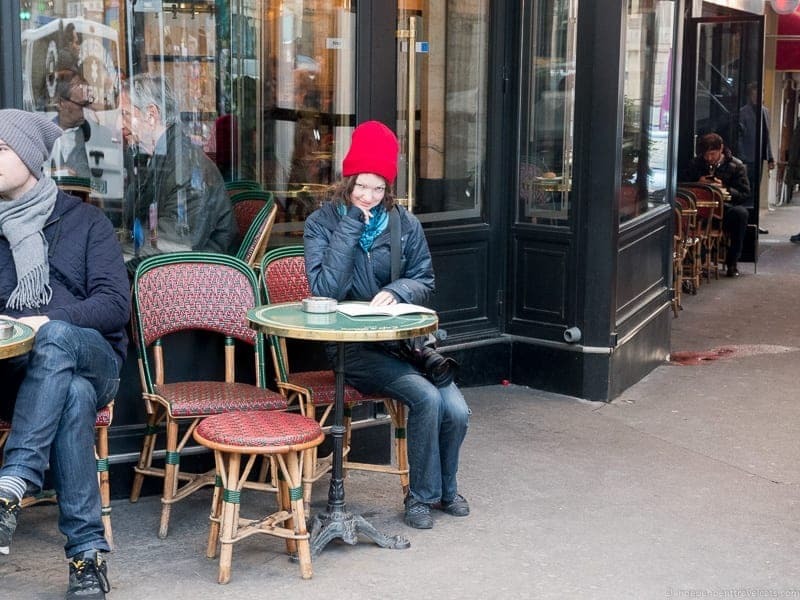 You will probably find more tourists than French intellectuals these days, but many locals do pop in for a morning coffee or before-dinner drink. Nice place to enjoy a cup of tea and people watch on the sidewalk terrace or admire the classic Art Deco interior that features red booths, mirrors, and lots of wood. The Les Deux Magots is another one of the historic coffeehouses in Paris (opened also in 1885 and sits next door to rival Café de Flore) that was also well-known for its famous guests that included a number of writers, artists, actors, and philosophers such as Ernest Hemingway, André Breton, and Pablo Picasso. The café offers a full menu so you can eat a full meal or just stop for coffee or tea. The café serves a small selection of tea from Dammann Frères. 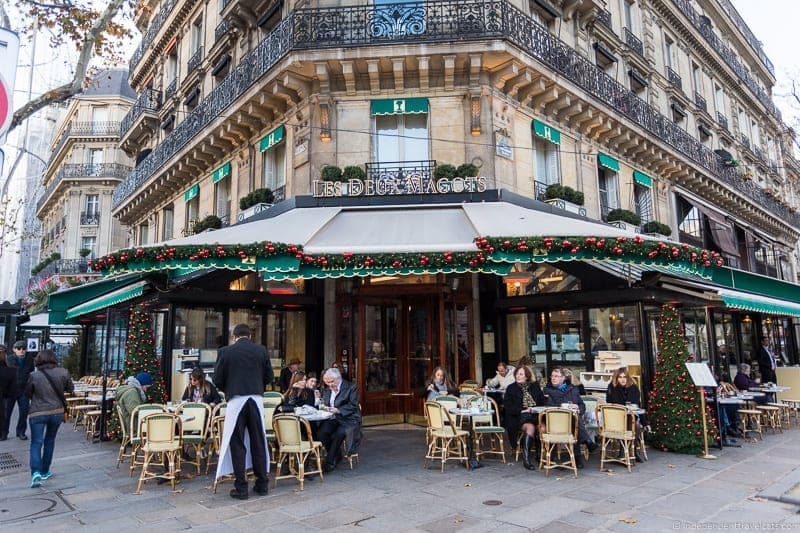 Similar to Café de Flore, Les Deux Magots offers both indoor and outside sidewalk seating. This is a popular Russia-based café (they have a beautiful café located in Moscow) that now has three locations in Paris. 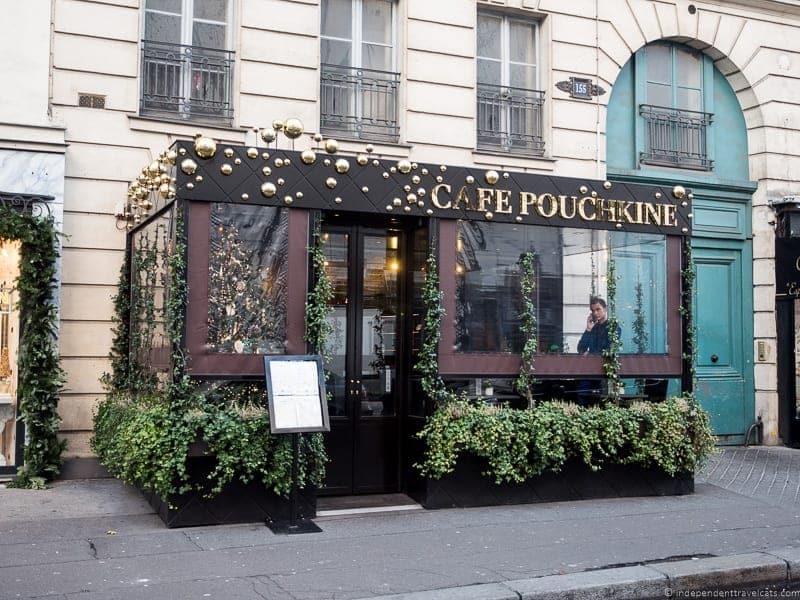 Although the restaurants are set up to look historical, Café Pouchkine was founded in Moscow in 1999. The history of the café is interesting as the idea and name come from a French song “Nathalie” by Gilbert Bécaud written in 1964; one lyric mentions the subject of the song going to Café Pouchkine in Moscow to drink hot chocolate. The place mentioned in the song was fictional until it became a reality in 1999. 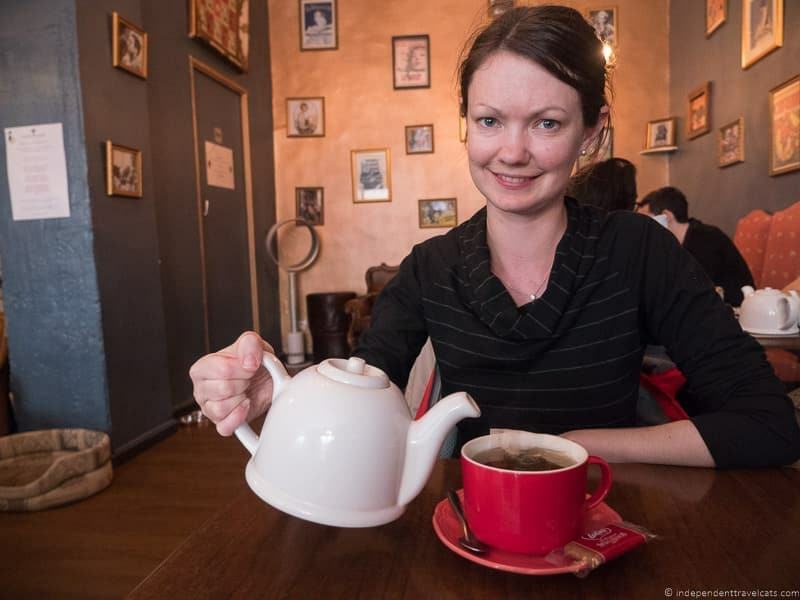 It is a great place for Russian food in Paris or just as a stop for coffee or tea. Perhaps tea pairs well with caviar and smoked salmon? They serve Pascal Hamour teas and you can also order the Pouchkine Tea for 15.00 € which includes your choice of tea and 4 macarons. You may not have considered an afternoon tea experience in a mosque but if you are looking for something different, you might consider trying some sweet hot mint tea and Moroccan pastries. This beautiful mosque includes a hammam, souk (shop), restaurant, and courtyard that are open to guests. If you are just having tea and pastries, you can sit in the open courtyard, but if you plan to eat a meal (the tajines are tasty here!) 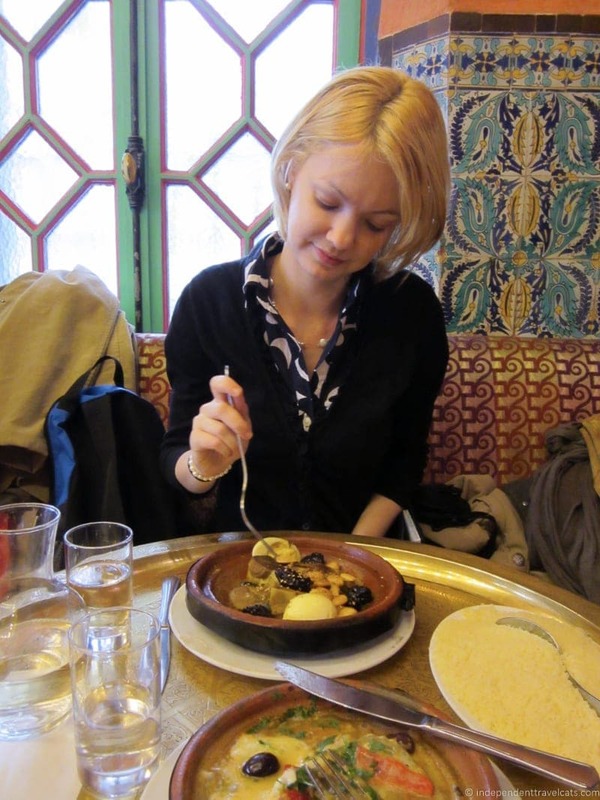 you will be seated inside the restaurant which is decorated in a style that will help transport you to North Africa. You’ll likely make some little bird friends whether you sit inside or out and they will eat escaping crumbs! At 2,50€ per pot, this might be one of the best values for tea in the city! 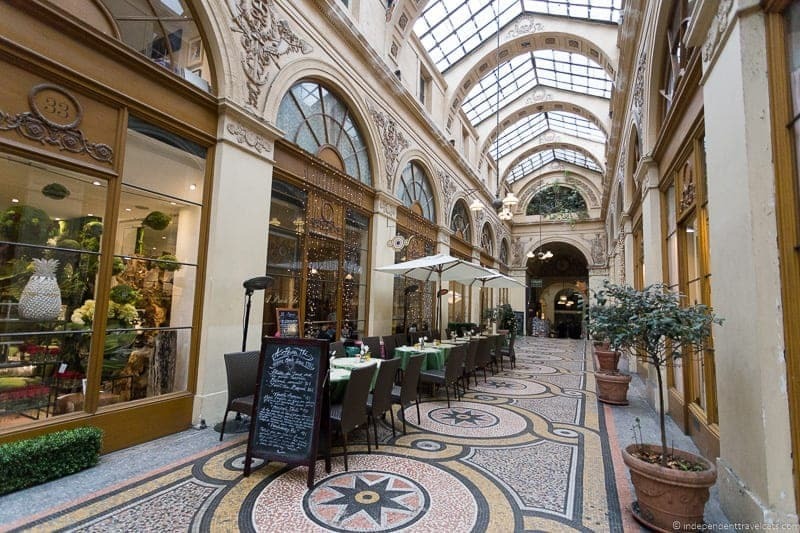 A Priori Thé is notable for its wonderful location in the Galerie Vivienne, a beautiful 19th century covered arcade. One of my favorite passages in Paris. A Priori Thé specializes in homemade foods at brunch, lunch, and tea time. It has indoor seating as well as a limited number of tables outside in the covered arcade. The cafe serves a selection of Dammann Frères tea as well as a few house blends. Tea and cats are two of my favorite things in this world, so I had to make a stop at one of Paris’s cat cafes. 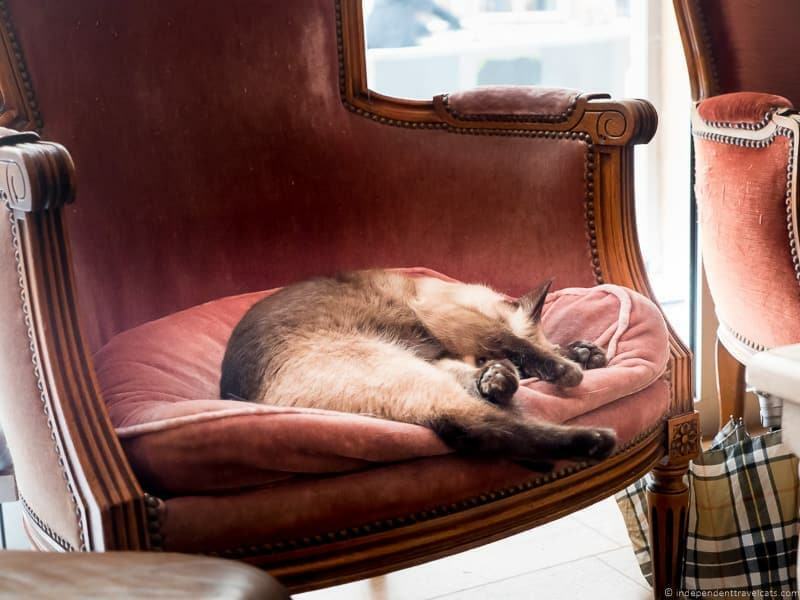 We visited Le Café de Chats, which serves tea and coffee as well as brunch, lunch, and dinner. 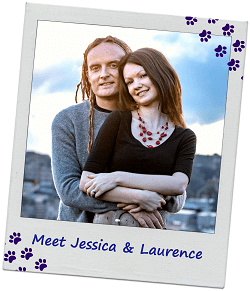 Unlike many cat cafes, it does not take reservations. In terms of tea, they have only a small selection of tea which comes as a pot of hot water and a tea bag so don’t expect a gourmet tea experience here. The cafe was crowded and the cats were mostly sleeping and hidden away in baskets and shelves during our visit (I’d advise going in morning or evening when cats are more likely to be awake). Although we were not that surprised the cats were sleeping, our experience here was disappointing as there was little space to interact with the cats if they had been awake (e.g., no open spaces on the floors to sit for example as in other cat cafés) and although the cafe has a set of rules in how to interact with the cats (e.g., no picking up the cats, waking them up, disturbing them, taking photos with flash), none of the staff enforced these and people were bothering the sleeping cats throughout our visit which made me angry. I am not sure if this is typical but it was the opposite of the positive experience I’d had at a cat cafe in Seoul. I love the name of this tea room which translates to “The Dormouse in the Teapot” which was inspired by Alice in Wonderland. The theme of the restaurant matches its name and it feels quite bohemian with mismatched furniture, walls covered with murals and musical posters, and Alice in Wonderland related wall hangings. Le Loir dans la Théière serves breakfast, lunch, and tea and is well-known for their savory and sweet tarts, especially their lemon meringue tart. A perfect spot for brunch or lunch if you are shopping or sightseeing in the Marais, or for just a warming cup of tea and a lemon tart! There are a number of other cafés and restaurants serving tea in Paris, way too many to list them all. The above just represent those we’ve actually been to so far. Here are some on the list for future exploration that you might also want to check out: Rose Bakery Tea Room (24 Rue de Sèvres, 75007, inside the Bon Marché department store), Maison de la Chine (72 Rue Bonaparte, 75006 Paris, in the Asian Cultural Center), and Nina’s Paris (9 rue Danielle Casanova, 75001 Paris). Paris is home to a number of famous tea brands. Purchasing tea can be great for taking home some of your favorite teas that you’ve tried and for giving as souvenirs to loved ones back home. Also for those on a budget, buying a box of high-quality tea is a great value as a 10 euro box may provide 20-40 cups of tea versus paying 5 euros for a single cup of tea at a cafe. Tea is not grown in France, but French companies are known for their high quality imported teas and tea blends. The most famous French brand is probably Mariage Frères. 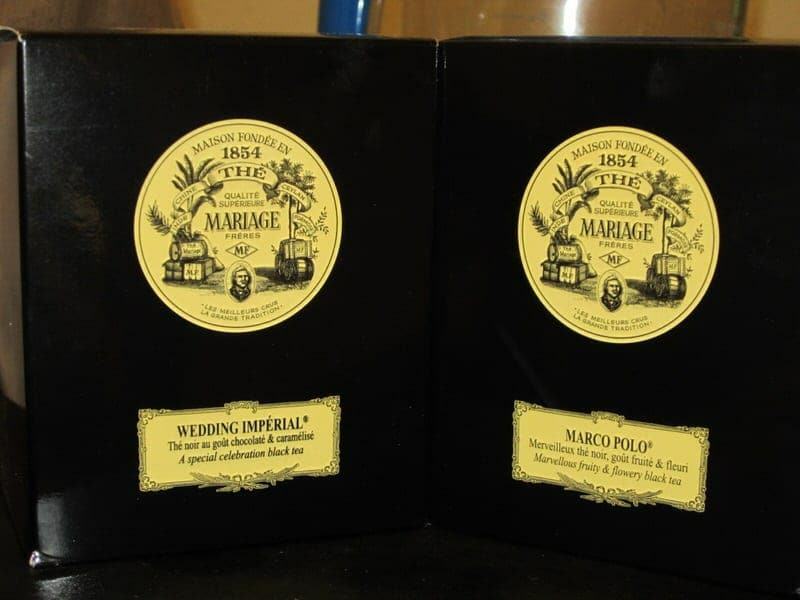 Two popular scented (flavored) black teas that I enjoy from Mariage Frères are the Marco Polo and Wedding Imperial black tea blends and I am also a fan of their Darjeeling. But they have a wide range of teas. Another Parisian tea brand that I enjoy is Dammann Frères and I love their Mélange Vénitien (Venetian Blend) which is a black tea flavored with vanilla and red fruits. 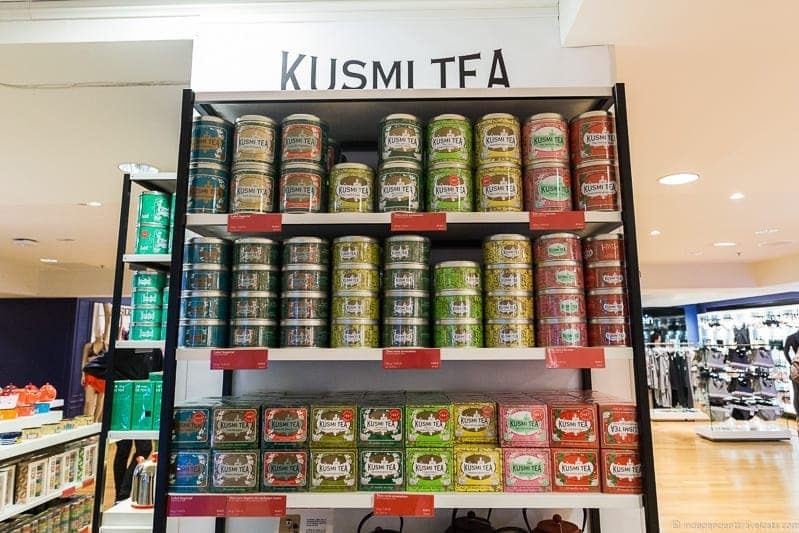 Another brand, Kusmi Tea that has been based in Paris since the Russian Revolution is popular for its Russian-style tea blends and its wellness teas. St. Dalfour, famous for its delicious French fruit jams, also sells more budget-friendly organic tea which can be found in many grocery stores throughout France. Another French brand that I have yet to try is Nina’s, which is known for its L’Original Marie-Antoinette black tea blend that is flavored with rose petals and apples, with the apples coming from the King’s Kitchen Garden at Versailles! 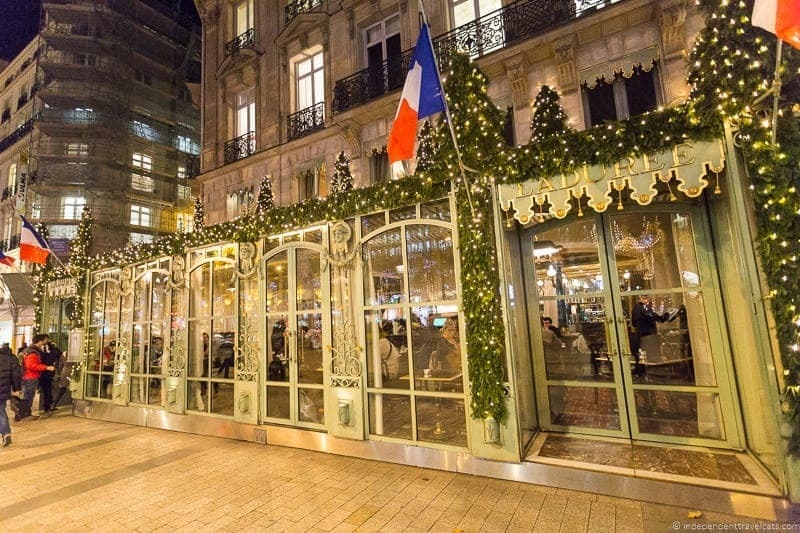 Three other French brands include Palais des Thés, Betjeman & Barton, and Fauchon. Tea is available for purchase both as loose leaf and in tea bags. This is not an exhaustive list and note that there are many other French companies that produce teas as well. For instance, many of the individual tea salons, restaurants, hotels, and department stores have tea sold under their own labels as well. French teas can be purchased at the retailer’s physical shops in Paris, online through the tea brand’s websites, and in many of the major department stores and gourmet shops in Paris. For instance Galeries Layfayette (a large Parisian department store) carries the Mariage Frères, Dammann Frères, and Kusmi tea brands in their Gourmet food section. St. Dalfour products can be found in groceries and gourmet shops throughout Paris and Europe. The best way to find out where you can purchase a certain tea is by checking the specific tea brand’s website. Even if you are not in Paris, you can purchase these teas online from the shop’s online stores and have them shipped to your home in some cases. 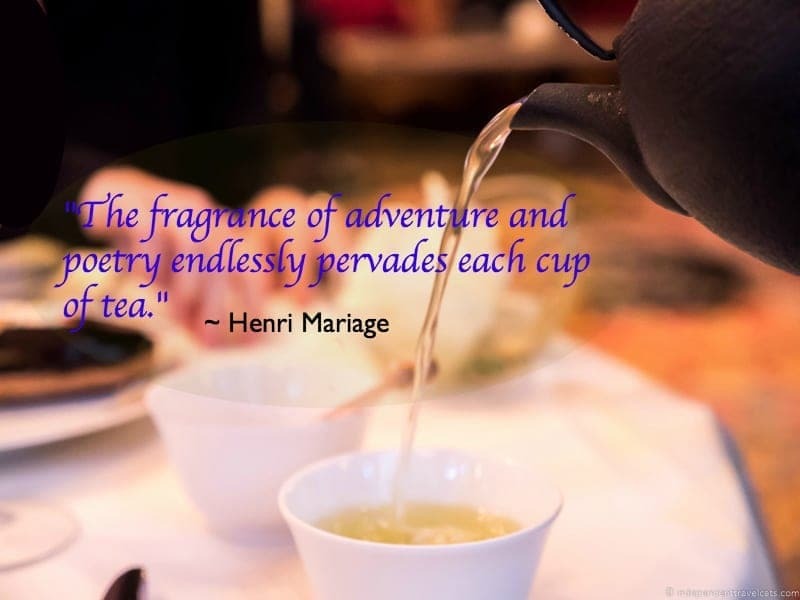 For instance, Mariage Frères and Palais des Thés ship their teas purchased online to most countries (including the U.S. and U.K.) although international shipping costs can be very high for those living outside Europe. You can also buy some of the tea brands through third-party gourmet stores such as Market Hall. If you can’t buy the tea you want through the tea brand’s website or if the shipping costs are too high, you can also currently purchase 7 of the 8 mentioned French tea brands (although some with limited selection) online through Amazon. 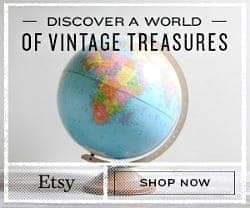 Here is a link which includes available products from 7 French tea brands, or you can separately just check out available teas from Mariage Frères, Dammann Frères, Kusmi Tea, St. Dalfour, Nina’s , Palais des Thés or Fauchon. Until recently, it was often very difficult to buy French teas outside of Europe so being able to buy them online provides a great way to experience them before or after your trip. I definitely love that I can buy them online through Amazon and I no longer need to hoard a stash of French tea before my next visit to Paris! Sunset in Paris on a bridge with Mariage Frères tea in hand – Perfect! Not only does afternoon tea have a long history in France, but it is a tradition that is far from dead. Far from being a country that only respects coffee and wine, you’ll find plenty of sophisticated French gourmet tea blends. 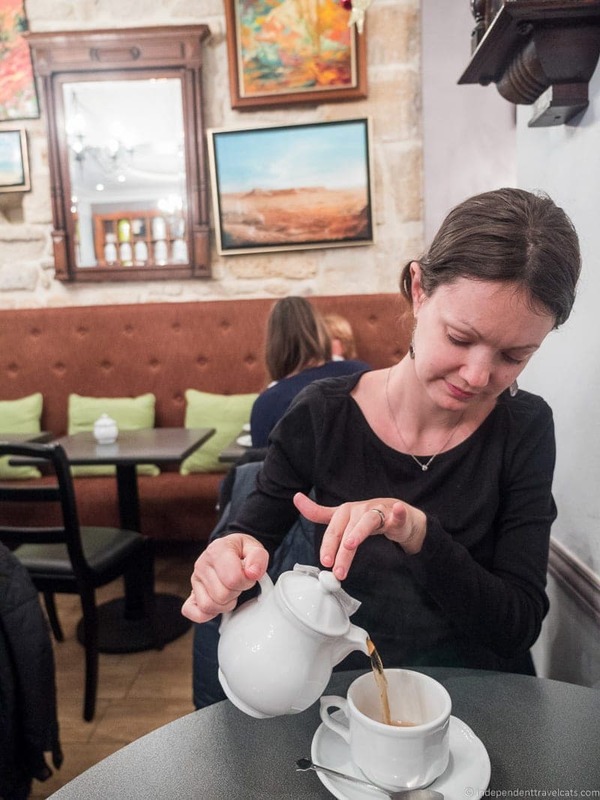 You may have a bit more difficulty finding a tea room in Paris than in London, but you have a lot of choices and we predict that tea will only continue to gain in popularity in Paris. 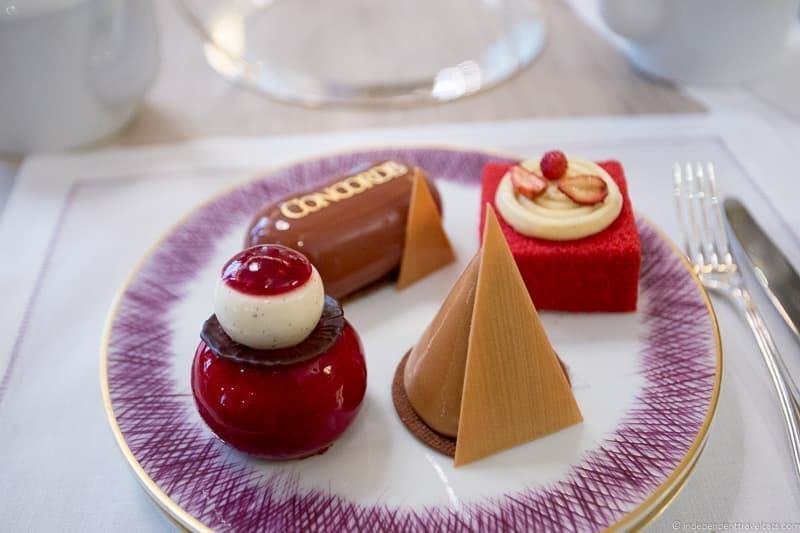 Whether you are wanting a luxury afternoon tea at a grand hotel, a cup of tea and a pastry at a cozy tea salon, or just to pick up a box of gourmet tea bags to take home with you, Paris has you covered. Be sure to spend some time indulging over a hot cup of tea and a sweet treat during your next trip to Paris. 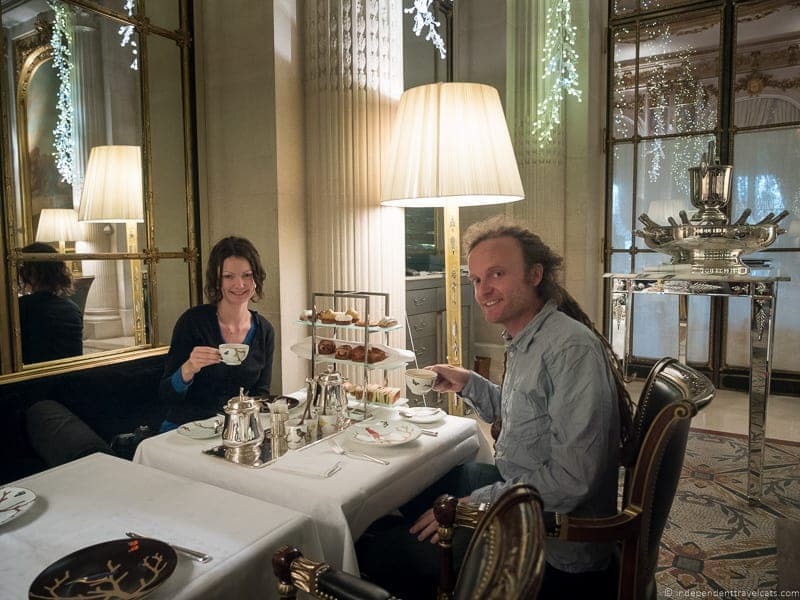 We are still discovering new places to have afternoon tea in Paris and finding new French tea brands, and look forward to returning soon to the City of Lights to do some more tea-related research! Have you tried a French tea? Do you have a favorite place to have afternoon tea in Paris? Tell us! 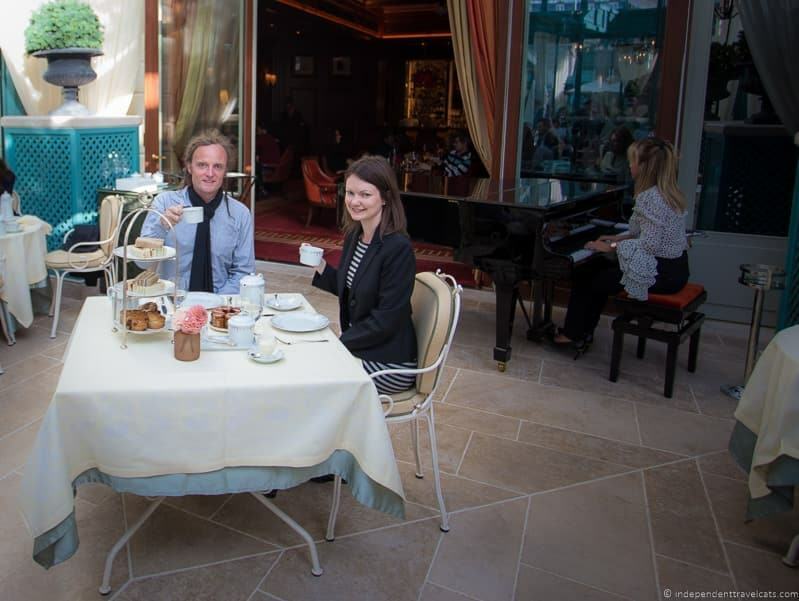 As always, we welcome your own thoughts and tips, as well as any questions you may have about afternoon tea in Paris! I went a few times for tea to the Ritz before its restoration. It was a great moment. Can I also suggest a great place to get awesome tea from passionnate people : George Cannon. It’s near the rue de Rennes and the selection is great. If you have the luck to meet the CEO or his son, you are in for a treat, they have great knowledge to share. The lady at the shop when we used to go there (6 years ago…) was very nice and was also skilled in Shiatsu which they proposed in a room in the tea shop. 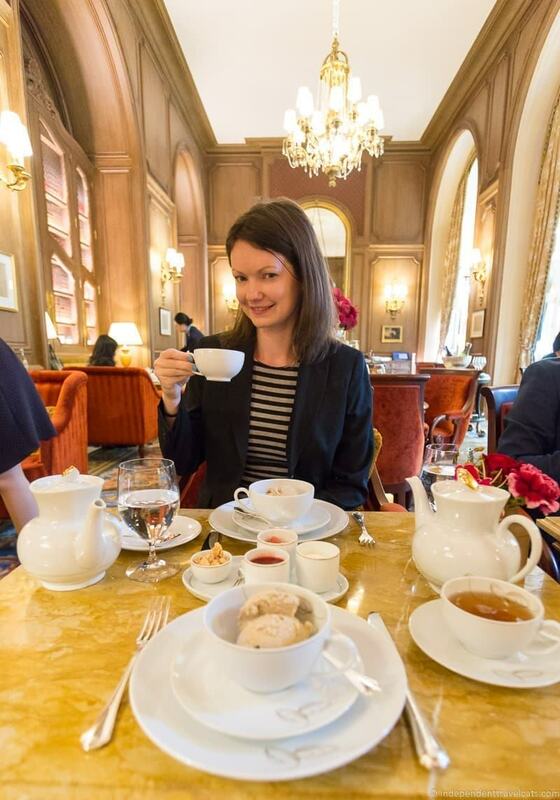 Hi there, glad you enjoyed afternoon tea at the Ritz in Paris, and yes, you’ll need to go again. They have basically the same tea they had before as well as a new one that is offered so you can try something new and see the new furnishings since the grand reopening. Thanks for the suggestions about George Cannon, I had not heard of them before, but will keep them in mind when looking for tea on future visits to Paris. Hi, Love this post! Thinking of getting an afternoon tea experience for my parents in one of the more casusal places in Paris. However we don’t know when we are going just yet and I would like to get it as a Christmas present. I’ve tried looking on several websites to see if they do gift certificates but so far not having much luck. 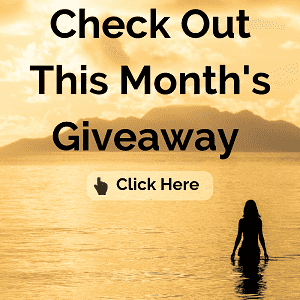 Do you know if any of these lovely places do gift certificates for an experience for two? Hi Chloe, I don’t know if any of the casual afternoon tea places in Paris offer gift vouchers. None do to my knowledge although you could try emailing or calling your favorites as they may have special gift offers for the holiday season (the multi-site spots like Angelina, Laduree, and Mariage Frères may be more likely than the one store spots) or be able to work something out for you. If you are looking for a quieter spot for tea for your parents I’d recommend a place like Musée Jacquemart-André. I loved your post. A lot of good information here. 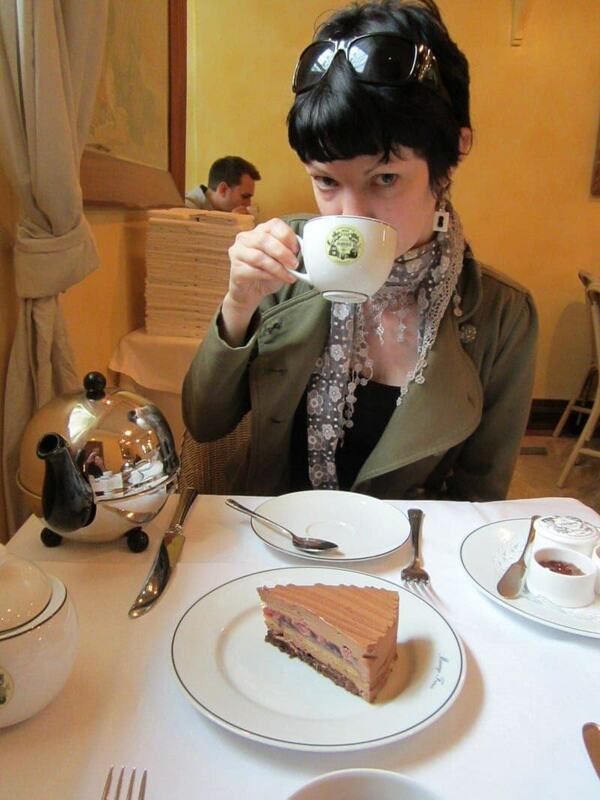 I would like to know if it is possible to have a High Tea at Laduree? I am searching for this info, going to Laduree’s websites and nothing. If you know anything about it, please let me know. A website, telephone, price, anything. 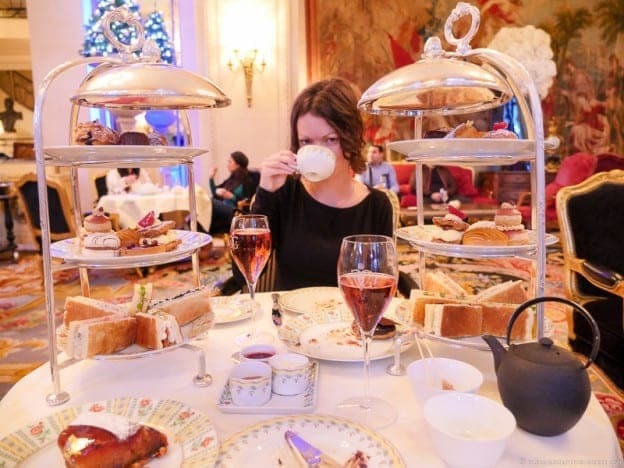 Hi I’m going to Paris with my daughter in December and we want to do a high tea – where would you pick for the nicest Parisian atmosphere and best desserts? I could hardly believe my eyes when I read about the Shangri-La’s vegan tea!! How wonderful. I miss tea when I’m away from home, and this vegan afternoon tea looks perfect. Way out of my price range, but I might just do it anyway. Thanks for this amazing blog. Great guide! 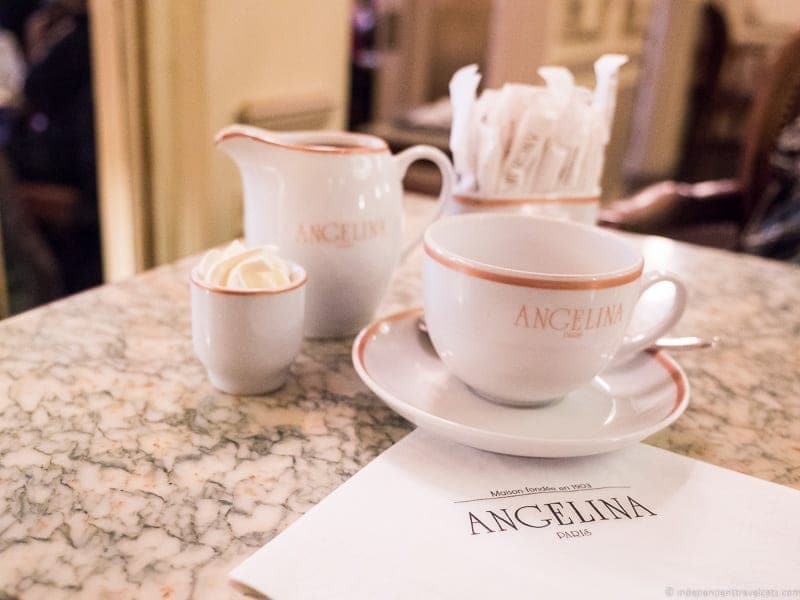 I love Angelina and I always have tea at Mariage Freres when I go to Paris. I would love to try some of the others, too! Reading this made me get up and make a nice cuppa tea (via microwave, so not nearly as fancy as in Paris). Your look has changed over the years. At first, I thought this was all in one trip, but I finally figured it out. I love how formal looking the tearoom in the Four Seasons is, and I think that having tea at a mosque would be particularly interesting. I’ve been to Angelina for the hot chocolate and actually found it a bit too thick for my liking. Perhaps I should have had the tea. Lovely post. Jessica, I love this post. I also love that you have about six different hair-dos! Hilarious. Beautiful photos. I love the one where Laurence is dwarfed by the tea trays! 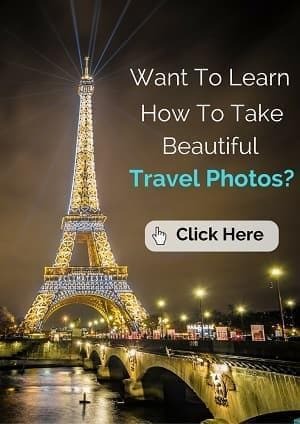 Love your pics – alas always out of my budget when in Paris (that and I usually opted for big lunches!~) but your photos are lovely! I”m not really a big “tea” fan, but having high tea is one of the ultimate indulgences. 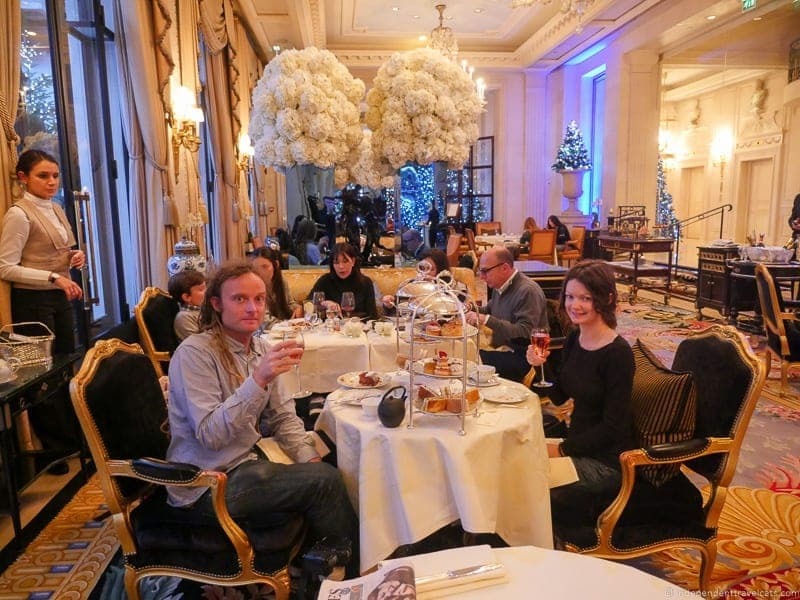 It feels so fancy and fun… we had tea at the Crillon when we were there and I will never forget it. Such a treat and well worth doing!